Large Carved Candles ''Red'' by Handmade at Home Decor Outlet Store. MPN: unknown. Hurry! Limited time offer. Offer valid only while supplies last. Large decorative candle will be a spectacular interior element. It will be particularly relevant as the decoration of Christmas or New Year table. DETAILS - Large decorative candle will be a spectacular interior element. It will be particularly relevant as the decoration of Christmas or New Year table. The product is made of stearin and paraffin, decorated using hand-carving technique. 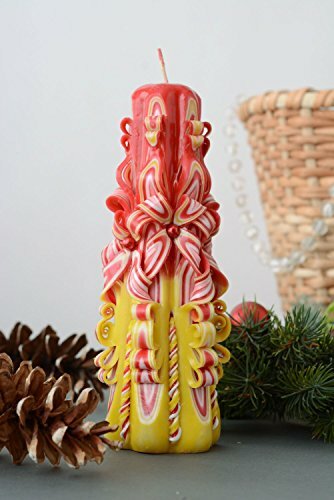 Striking yellow-red candle will be a highlight of interior composition.